As projects pile up, you want the comfort of knowing there’s an easier and more efficient way to deal with your approvals. 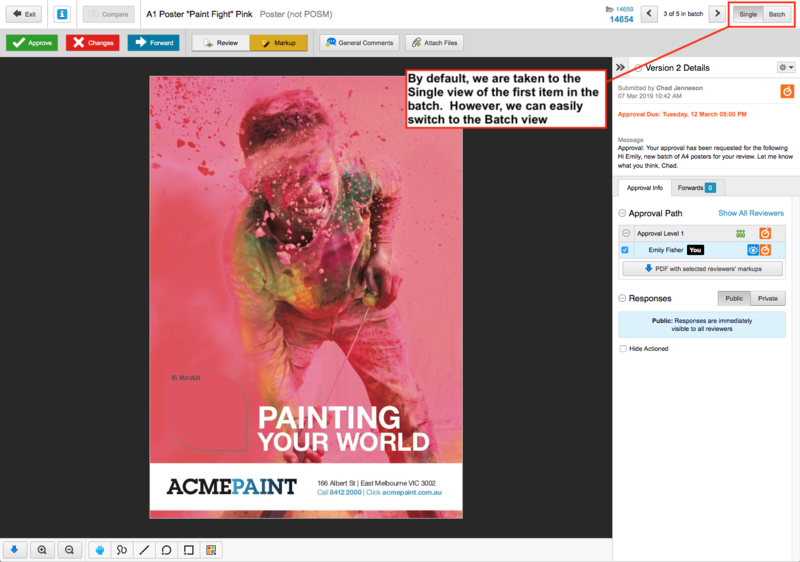 With this, we’d like to introduce you to our new Full Screen Approval feature which enables users to review a batch of artwork all on one screen. That’s right – just one screen! Until recently, a reviewer who received a batch of approvals had to scroll through each deliverable on different screens. If that sounds a bit ho hum, then the good news is the Full Screen Approval feature has changed all that. Now users can save a whole lotta time (and redirect that into creative endeavours) by reviewing a batch of approvals on the same screen. Review all approvals in a batch to expedite the review/approval process. Instant visibility over the approval status of all batched items. In just a few clicks, forward as many items as you like on to other reviewers. All good, just select the items and then approve. Use the zoom function to inspect a deliverable at closer range. Speed up your approval workflow across the board. Less frustration and approval delays as reviewers no longer have to review deliverables individually. More time to focus on being creative! 1. In digital advertising: e.g. when you have a number of banner ads or web pages that need to be reviewed at once. 2. In print marketing: e.g. when producing a catalogue or brochure where you’ve got many deliverables divided into different categories. 3. In local marketing: e.g. when producing posters across many branches with a different name and/or image on each. 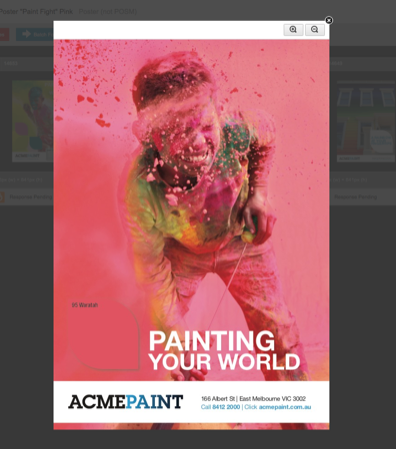 View this video to see the Full Screen Approval feature in action. You might also enjoy these admation spotlight features. A batch of deliverables have been submitted for review. ‘Single’ view is the default mode. 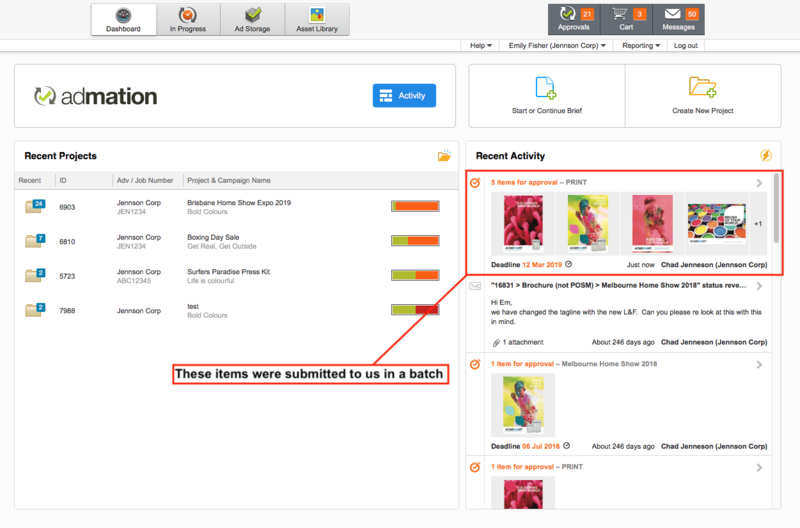 Just switch to ‘Batch’ view to review your items in a batch. The icon in the bottom left corner of each item will provide an instant status update. In the top righthand corner, you can click on the icon to see a ‘Single’ view. If you click on the thumbnail you can zoom in on the artwork for a closer inspection. To Approve/ Request Changes/ Forward items, click on the checkbox in the top left hand corner. Schedule a demo with our product team to learn more about admation, and its key features.